I found this tray at the Bemidji, Minnesota, Goodwill on a recent trip. 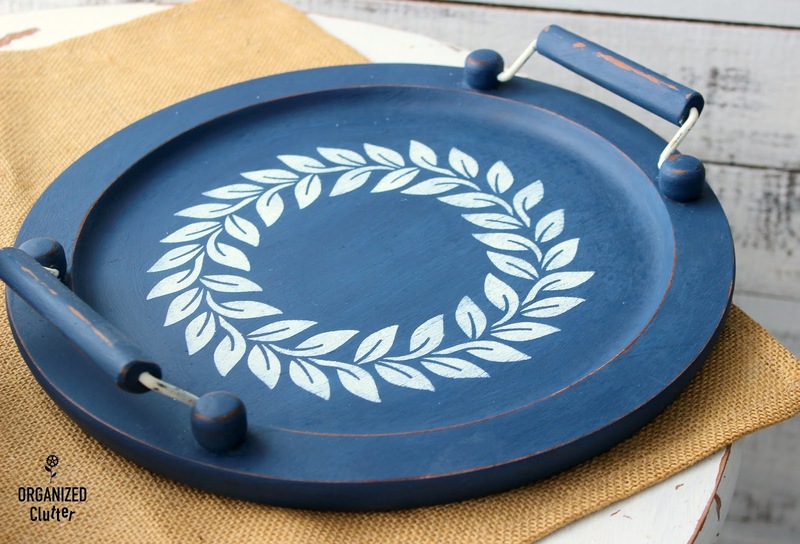 Of course this tray could be used for serving, but I also like trays to contain a vignette, and/or add interest/height. 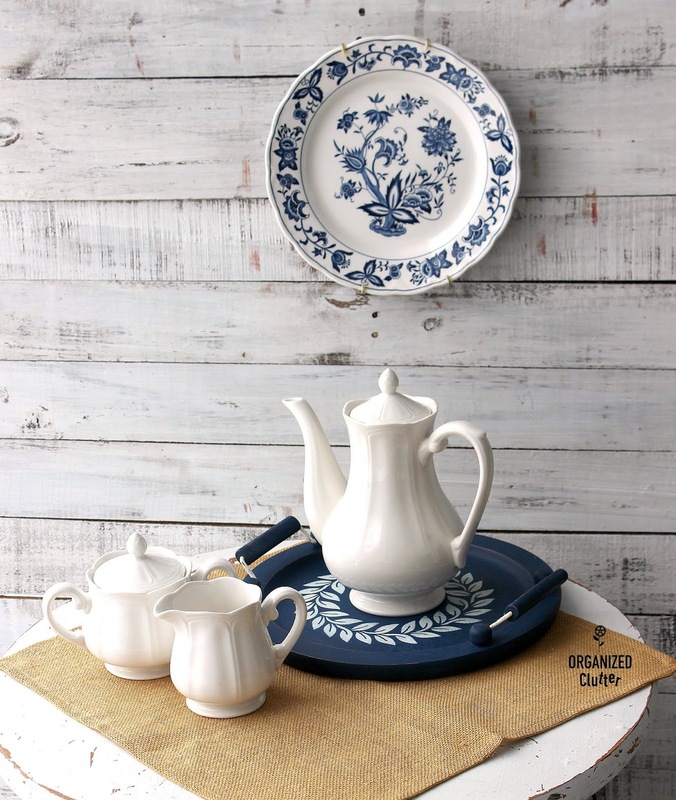 Do you like blue and white china? I do. Even though my living room has gone more neutral, I still display a few blue and white plates. I love them mixed in with white ironstone pieces. 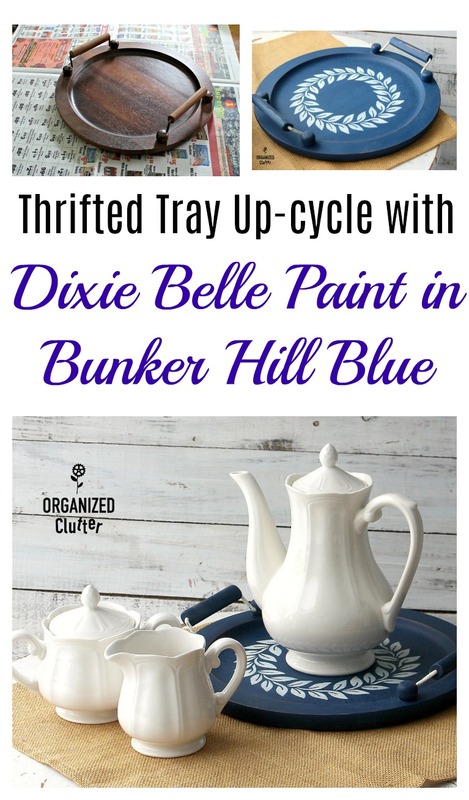 I used Dixie Belle Chalk Finish Paint in Bunker Hill Blue to paint my tray. I brushed on two coats, using my Zibra Grip-n-Glide 2-Inch Stubby Handle Paint Brush . (Minimal brush strokes with the Zibra brushes). 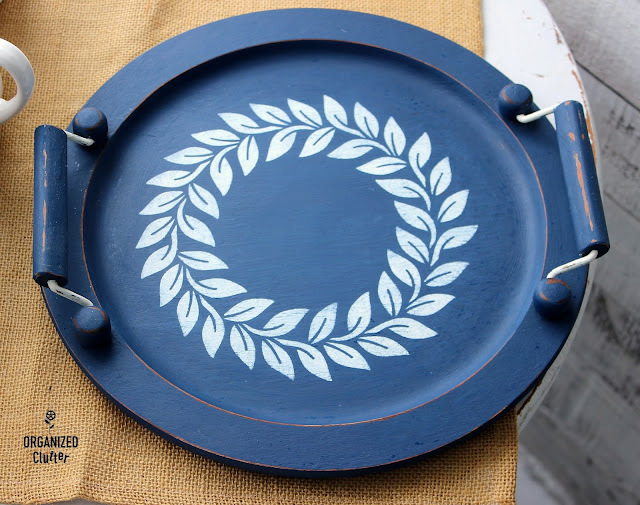 I used my laurel wreath stencil from Hobby Lobby to add a design to the tray. I clipped the corners off of my stencil so it would fit in the tray better. Then I taped it down with blue painter's tape. 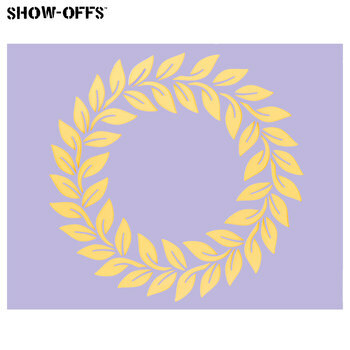 I stenciled the wreath using Ceramcoat Acrylic Paint in Light Ivory . I also painted the metal on the trays handles with the light ivory craft paint. I then sanded the edges and handles to reveal some of the stained wood under the paint with 220 grit sandpaper. I also gave the whole tray a very light overall sanding. 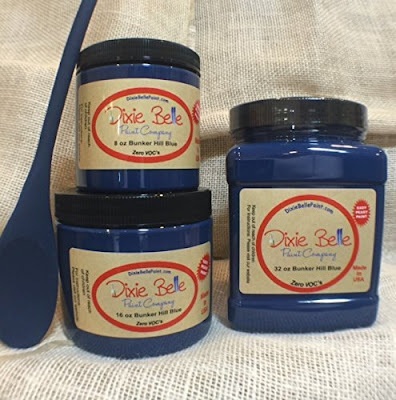 I applied a light coat of Dixie Belle Best Dang Wax in Clear with one Intex Pfc Precision-fiber Paint & Cleaning Rag, and rubbed it down with another fiber rag when the wax was dry. Best Dang Wax is water based and so easy to apply! I love the blue tray with white ironstone and my blue and white plate. 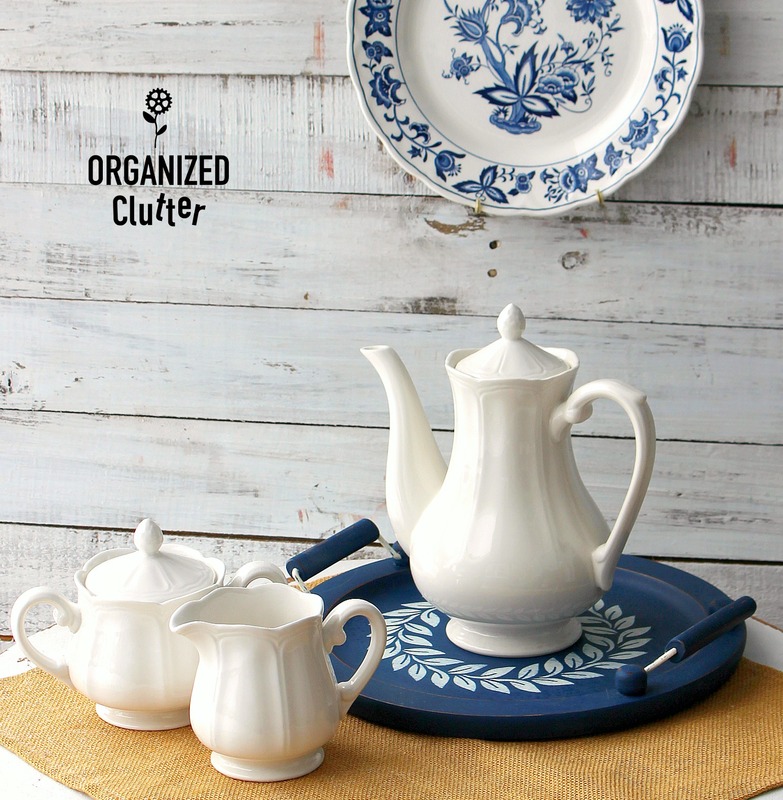 The tray works with the ironstone coffeepot, and creamer and sugar bowl. Much more interesting than displaying the three pieces without it. Trays are fairly easy to find at thrift shops too! I do like the Bunker Hill Blue color, and Yankee Blue is pretty great too! Simple but striking, Carlene! Blue is a favorite color of mine, too. I like the shade of blue that you used on the tray. Looks great with the white dishes and such a simple project. I must be off to look for a tray to transform! What a beautiful color! It turned out beautiful.